McFarland & Co., Jefferson, NC 2017. 248pp. This is a book stuffed with information and useful thinking for all those who seek a scientific approach to paranormal phenomena or have an interest in those who do. Hill, a geologist by training, has spent years researching oddities and oddity-seekers. I've interviewed her before for this blog. 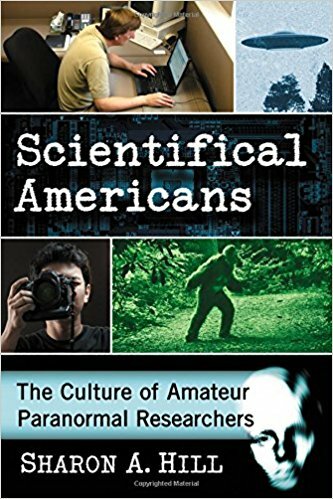 She reports here on her survey and study of amateur research and investigation groups (ARIGs), mainly concerned with UFOs, ghosts, and cryptozoology. There are at least 2,000 ARIGs, with ghost-chasers predominating. Hill draws a distinction between paranormal (phenomena that might be proved/resolved by science) and supernatural (which can’t, although ghost hunters keep trying). She argues strongly that groups saying they are “scientific” usually grade out between poor to nonexistent when it comes to sticking with the precepts of good science. While Hill emphasizes there is no simple definition for science or the scientific method, there are many sound principles shared between scientific endeavors. She does not present science or scientists as perfect, another important point often lost in short articles in the media that tend to go for simplistic believers-v-skeptics stories. Her analysis of what is and is not scientific and why a lot of perfectly intelligent Americans have trouble with the distinction is worth the price of the book by itself. Hill suggests some science educators view the public too simplistically, as mere receivers of facts, while a good chunk of the public views science as a static collection of facts and rules. The influence of the internet and paranormal TV series (almost none of them scientific to any useful degree) has drawn huge numbers of people into paranormal investigation but hasn’t achieved any documented results. Neither the number of investigators nor the increased number of witnesses (also greatly increased by the influence of internet and TV) have done any lasting good: a larger number of sightings does not add up, scientifically, to a stronger case. That doesn’t mean the sighting reports are useless, but Hill laments the lack of analysis of the sighting files and databases for patterns. Hill’s chapters on the three main areas of “study,” ghosts, UFOs, and cryptozoology, are good but necessarily leave out a lot in condensing broad and diverse topics into single chapters. The Bigfoot-focused chapter on cryptozoology misses mention of the enormous influence of the late Dr. John Napier. Here’s where I wish the book were longer: the brevity of these chapters and the book itself doesn’t allow Hill to tell us much about individuals, aside from a good piece on a pair of ghost hunters and a much shorter bit on two skunk ape hunters. Still, the research and insights on ARIGs and overall paranormal beliefs make every page worth reading. (Hill mentions “uniforms,” such as the black shirts common among ghost hunters, and notes, “Cryptozoologists typically require a hat…” I found that both humorous and true: I’ve never done any sort of cryptozoological appearance without my low-crowned black Stetson, and hats like the late Scott Norma's fedora and Ken Gerhard's leather cowboy hat are iconic in the community.) The ghost chapter and the book’s extensive bibliography do miss what I think is the best book ever on the topic, G.N.M. Tyrell’s Apparitions (1953). Hill critiques ghost hunters in particular for assuming that the things they can detect (variations in the environment picked up by EM meters or infrared cameras) are automatically considered evidence for things they can't (ghosts themselves). A drop in temperature, say, is is considered significant even though the link between such measurements and the supernatural hasn’t been established. She DOES think amateurs have a role to play in scientific investigations. Hill cites the unknown-primate DNA study of Professor Bryan Sykes, in which amateurs worldwide contributed samples to an expert: the negative results don’t invalidate the approach. It all adds up to an excellent book, not only on the primary topic but on the definition and philosophy of science and the role science plays (and should play) in American society. When the main criticism comes down to wishing the book were longer, the author has done a great job. Thanks Matt! A very fair review. Regal and Buhs books do a far better review of cryptozoological history. Funny thing, I've been trying to get Tyrell's Apparitions and am having a hard time. I heard from others that it is a must-have. Sharon, I’ll send you mine. It’s hundreds of books deep in the read-again pile, so it’s not doing anything useful. Right there on Amazon!! Now I will have to get it, too. Thanks! How small can a mammal get?